Mr. Watts Phillips's new drama called "Maud's Peril" [23 Oct, 1867] has formed the chief attraction at the Adelphi Theatre for the past month. 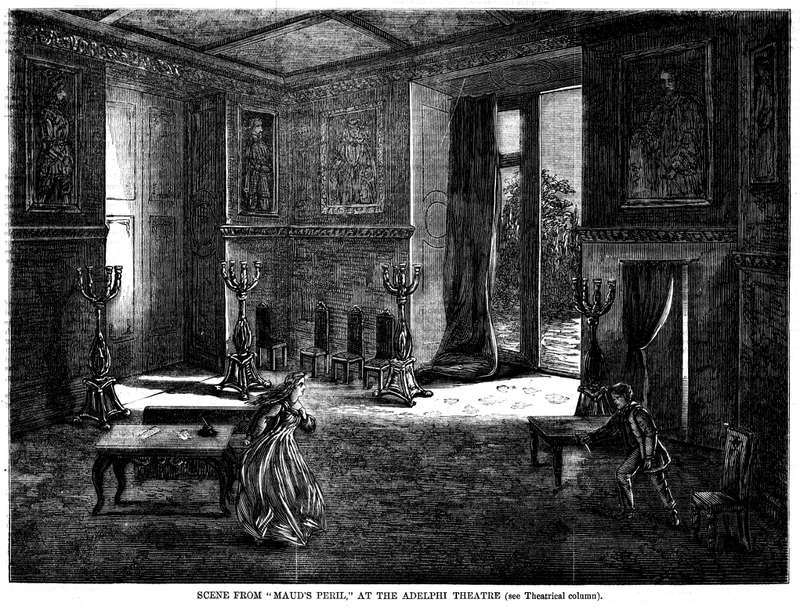 The scene which our artist has selected for the accompanying illustration represents Toby Taperloy, the escaped convict, in the room adjoining that in which he has just attempted to murder Sir Ralph. Lady Challoner, alarmed by the cry of the wounded baronet, enters the room in time to recognise the features of the assassin, though she is unable to oppose his escape. The shock is so great that she loses her reason for a time, but as we stated in our detailed notice of the piece some weeks ago, she ultimately recovers, and Taperloy meets with condign punishment.